The LANIER MP 6503/MP 7503/MP 9003 combines speed, reliability, smart technologies, and versatile multifunction capabilities to streamline your data and document workflow, in the office and on-the-go. Streamline business processes and increase productivity with an immersive 10.1″ Smart Operation Panel, fully redesigned user interface, and connectivity right from your Android or iOS device. Connect to the cloud and deploy customized solutions to enhance collaboration and tailor the MFP to the needs of your unique business. Create personalized workflows and automate manual tasks with one-touch icons designed to simplify complex jobs. It is a whole new way to work, powered by innovative Lanier technology, with the ability to create unique and customized solutions, and deploy workflow applications that streamline business. Keep pace with the speed of business thanks to fast output speeds on a wide range of paper stocks and robust paper capacities. Give IT administrators the power to manage devices remotely and achieve maximum system uptime with continuous peak performance. Stay ahead of the competition with features and functions that deliver upon Lanier’s commitment to information mobility. Designed for high-volume environments, these systems empower your organization with more ways to securely capture, share, and organize your data. Keep connected to the information you need in the formats you want. Benefit from full-color scanning, multifaceted printing, convenient copying, and flexible faxing options. Our products makes it easy to stay green and be responsible with smarter technologies and embedded eco-friendly features that reduce electricity expenditures, paper usage, and overall operating costs. In today’s digital world, data and document security is essential. Our MFPs provide a host of standard features and offer optional advanced solutions to protect your internal and external business communications. Control quality, speed turn-around time, and ensure the confidentiality of your advanced document production with in-house, professional finishing. From stapling to folding, these systems offer workgroups, large businesses, and light production environments the professional finishing options they need for true end-to-end document production. Lanier’s Workstyle Innovation Technology leverages advanced technologies and user-friendly features to ensure you have the options you need to achieve success in the new world of work. A modern communication hub at your fingertips. The all-new 10.1″ full-color, softkey Smart Operation Panel comes standard and offers a host of new ways to streamline multifaceted workflows. Its responsive design makes it easy to deploy customized solutions, integrate multiple processes, and simplify complex tasks with one-touch icons. Bluetooth, QR code technology, and NFC options further expand how you can interact with and share information, while USB and SD card slots ensure information is always accessible. Customize the wallpaper and program messages that display directly on the screen. Activate Remote Support with one tap directly from the panel, simplifying and expediting maintenance if necessary. The feel of a smartphone or tablet comes to your MFP. The sleek and stunning new user interface was designed to help you accomplish more. Dive right into a familiar tablet-like experience and perform everyday functions with the ease of drop down menus and the ability to swipe from one screen to the next. Individual users can customize their settings to match personal workstyle preferences and preset delivery destinations to further boost efficiency. 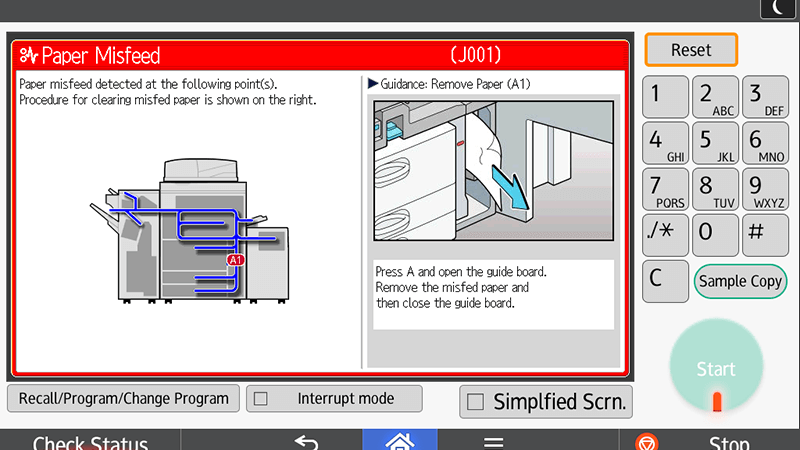 Quick UI screens provide access to basic features for simple copy, print, fax, or scan jobs. Classic UI screens mimic the traditional interface for users more comfortable with the classic style of Lanier job programming. Single Function Apps guide users through common jobs such as ID Card Copy, Scan to Folder, or Shared Folder Printing. Leverage technologies from today’s digital world to support a modern and mobile workforce. Elevate your productivity with apps built and tested for your MFP. Tap into our new dedicated site directly from the Smart Operation Panel to access a gallery of productivity-enhancing applications created to improve operability, simplify job tasks, and deliver a more streamlined user experience. This application provides you with easy to use advanced copy functions for preparing meeting handouts. Both sides of the ID card can be scanned and stored as a single page. The scanned data can be sent to a specific folder or an email address. You can also print the scanned page. A setup wizard for registering the destination of documents that have been scanned by using Scan to SMB. You can print files stored in a shared folder from the MFP. You can preview the file and check the print status before printing. Access information from the palm of your hands. Business happens fast and you need the ability to keep information moving. Lanier’s Smart Device Connector App gives you the power to harness the multifunction performance of the MP 6503/MP 7503/MP 9003 from Android or iOS phones or tablets. With this app, user productivity increases as on-the-go workers and visitors can easily connect to the MFP via Bluetooth, NFC technology, or by scanning the QR code directly on the panel. Once connected, they can print, scan, copy, and fax directly from their smart device and keep information moving. Navigate, view, access, and print from the Web. With an integrated Web Browser, it’s easy to navigate web pages, access cloud-based applications, and print HTML and PDF content directly from the Smart Operation Panel, with no computer or additional smart device required. And with access to helpful how-to videos directly from the control panel, you can learn how to make even more use of the MP 6503/MP 7503/MP 9003’s robust features and functionalities. Advanced technologies and impressive features maximize uptime, keep your workflow moving forward, and handle the toughest workloads. With continuous print and copy speeds of up to 90 pages per minute, scanning speeds of up to 220 ppm, and a true 1200 dpi resolution, these systems make it easy to capture and output critical information, large presentations, letters, layouts, and more, always with high-quality results page after page. Clear paper jams quickly and efficiently with animated graphics that highlight the exact location of the jam and guide you through the process of correcting it. Enjoy continuous, uninterrupted performance with a standard tandem tray that allows users to reload letter-sized paper even while an active print job is running. Ensure the MP 6503/MP 7503/MP 9003 is ready to go before you even arrive at the control panel with an innovative Motion Detection Sensor that powers the systems from sleep mode before approaching. Output large jobs with confidence and achieve the look you want. The MP 6503/MP 7503/MP 9003 accepts a wide variety of stocks in sizes up to 11″ × 17″ and 111 lb. Cover/300 gsm, enabling organizations to produce professional quality brochures, presentations, business stationery, mailings, and more, in-house. *LCT provides additional 4,000 sheets of 8.5″ × 11″ paper, or 2,500 sheets of 8.5″ × 14″ paper with optional tray extension kit. Network options to fit your workstyle and workflow. The MP 6503/MP 7503/MP 9003 offers optional IEEE 802.11a/b/g/n support, allowing the device to connect to networks wirelessly. This provides the freedom to place these systems in the most convenient areas of your organization without the burden and costly expense of adding additional network drops. With the USB Device Server option, these advanced MFPs can support two IP addresses, enabling one system to connect to two different networks simultaneously. This option is ideal for environments such as schools, libraries, medical offices, legal firms, and government agencies that have frequent visitors and freelancers who access the MFPs but should not have access to information on the main network. Monitor usage. Simplify troubleshooting. Minimize IT costs. Increase uptime. Automates service calls and reduces potential downtime by enabling IT administrators to monitor usage and device diagnostic data remotely. New remote capabilities provide improved service support from a one-touch icon located directly on the panel. Keep your systems up to date with this driver installation tool that allows IT to automatically access and install updates. Compatible with Windows OS. Monitor, configure, and update a single device or an entire fleet of devices via a simple Web-based interface. Consolidate multiple devices into a single, versatile system that meets your high-speed, high-volume needs. Capture information in its original format and get it where it needs to be, when it needs to be there. The MP 6503/MP 7503/MP 9003 streamlines workflow with high-speed, high-capacity, full-color and B&W scanning. The Single-Pass Document Feeder scans both sides of a two-sided document in a single pass at speeds of up to 220 images per minute and easily handles mixed-sized originals. Advanced management tools, productivity enhancing apps, and other options also improve user productivity, streamline workflow, and ensure the accuracy of communications. Scan-to-functions include: Scan-to-email, scan-to-FTP, scan-to-folder, and scan-to-removable media (USB Drive/SD Card). Users can also scan documents to a secure PDF format. The system will automatically minimize the file size to increase the speed of distribution. Batches of documents and mixed-sized originals can be quickly and easily scanned utilizing the document feeder. The system will automatically detect the direction of text in the hard copy original and rotate the digitized text automatically, eliminating the need for manual correction. Additional system settings can be configured to detect and omit blank pages, making it simple to scan single-sided and duplexed originals in the same batch. Single pass scanning also helps to reduce the wear and tear on originals. OCR Scanning transforms hard copy documents into searchable PDF files. Using optical character recognition (OCR), the text from a scanned document is converted into data and inserted into a PDF. Using standard software such as Internet Explorer or Acrobat Reader, information within scanned files can be quickly searched by keyword or phrase. The Copy and Paste feature allows users to extract and paste text into other documents, eliminating rekeying errors and increasing job-task productivity. The optional OCR unit can process originals containing up to 40,000 characters per page, detect and omit blank pages, and offers support for 14 languages. GlobalScan NX scans paper documents and transmits the results electronically to various systems, thereby providing an effective document management solution. These systems produce high-quality output at up to 90 pages per minute with a 1200 × 1200 dpi resolution. Additionally, Default Duplex Printing improves paper usage and reduces the number of sheets used per print job, leading to minimized operating expenses. And with a standard Bypass Tray users can keep the guess work out of printing with automatic paper size detection and support for specialty stocks and envelopes. All models feature office-favorite PCL drivers with optional true Adobe® PostScript 3. Both drivers have the same easy-to-use “one-click” interface, which makes it simple for users of all levels to print the most complex documents with ease. With FlexRelease CX, documents can be printed when you need them, from anywhere you happen to be, to a FlexRelease CX-enabled printer without having to install a driver in advance. This revolutionary cloud printing system creates a whole new flexible way to print, making your business smarter and more versatile than ever. Download Lanier’s Smart Device Connector App to print from Android and iOS devices with the same features and options you would have from a desktop. The app also allows you to print files from cloud-based applications such as Google Drive. Embedded card slots at the control panel provide users with the ability to print files saved on USB drives and SD cards directly at the system without having to connect their computers. Files can first be previewed on the smart panel to ensure they are correct before outputting. This feature is especially convenient for educational institutions, real estate firms, and organizations that have mobile workers, freelancers, and visiting consultants. Get jobs out and moving with first-copy out times of 3.2 seconds on the MP 6503 and MP 7503 and a speedy 2.9 seconds on the MP 9003, along with copy speeds of 65, 75, and 90 pages per minute, respectively. 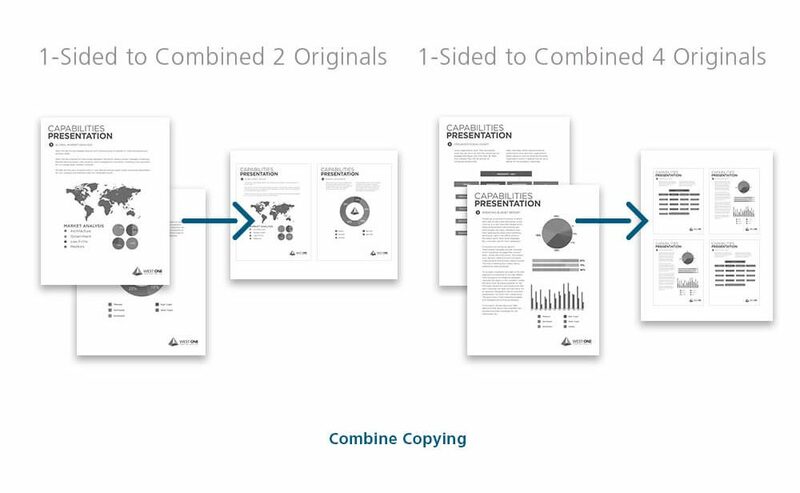 And with improved copying features, duplicating originals has never been easier. Users can copy both the front and back sides of an ID card, onto the same side of a single sheet of paper. Copy two single-sided pages or one double-sided page to be printed as a two-sided page. Combine various pages of originals onto one sheet of paper. Assembles copies in sequential order, rotated by 90 degrees. A range of fax functions and options to reduce communication costs and help organizations work smarter and greener. Users can send documents from their computers through the MFP to a standard fax number (LAN faxing) or directly to an email address (Internet faxing). The Remote Fax option enables up to five MFPs located within an organization to share a single fax line via a main designation MFP with a built-in networked fax. This allows users to send and receive faxes from the satellite units via a designated, main MFP. Incoming faxes are stored directly on the MFP’s hard drive. Stored faxes can be viewed as thumbnails on the control panel or from any network computer via Web Image Monitor, then printed as required. Faxes can also be forwarded to a predestinated folder or email address. Using IP-Fax, faxes can be transmitted in real time to the addressee’s fax machine without requiring an email server, facilitating reliable communication. Being compliant with Recommendation ITU-T T.38, IP-Fax also has a high degree of affinity with IP telephone systems, enabling voice and fax to be integrated on IP networks. Users can store commonly used forms and frequently accessed files directly on the MFP’s hard drive in the Document Server. Increase productivity, reduce communication errors, and eliminate the wasted expense associated with outdated, pre-printed documents. Stored files can be quickly retrieved, previewed as full-color thumbnails, and immediately printed on-demand. Up to 200 separate folders can be designated as Shared or Personal, named for easy identification, and set with passcodes for security. Discover advanced document and data security solutions to control user access, encrypt sensitive data, and stay in compliance with mandated regulations. Information stored on the hard drive is secure at all times. Client confidentiality is especially important in the fields of Health Care, Insurance, Finance, Government, Legal and Education, and is often a key factor when purchasing new technology-related equipment. The MP 6503/MP 7503/MP 9003 comes standard with two powerful levels of security that ensure information stored on the hard drive is kept secure at all times — the DataOverwriteSecurity System (DOSS) and HDD Encryption. The DOSS automatically overwrites the area of the hard drive used for image processing after the completion of each job. This makes it virtually impossible to extract sensitive data from the hard drive, even after the system has reached end of life. The Standard Hard Drive Data Encryption function encodes documents stored on the hard disk drive, as well as address book and authentication information. Data files are safeguarded even if the hard drive is removed. Built-in security features and network authentication options encrypt data and allow administrators to restrict device access to specific system functions. Administrators can create passwords to control and track device access. Usage can also be limited to specific system functions based on login credentials. Administrators can set quotas by individual or by user groups to control print volumes. The optional NFC Card Reader provides a cost-effective option for user authentication. This also saves you the time of entering a user name and password for secure use of the device. To eliminate the risk of confidential documents being left out in the open, individuals can utilize Locked Print and release files only when the user enters their ID and passcode at the system’s control panel. Scans can be saved as digitally signed PDFs or in PDF/A format to safeguard data in an unalterable format. Additionally, users can place watermarks on copies to prohibit the unauthorized duplication of confidential information. To keep output organized and reduce the waste associated with unclaimed and misplaced prints, users can select the Hold Print option. Files are stored on the document server until selected at the control panel. Additionally, jobs can be printed with a job sheet that identifies the originator, making it easier to distinguish work in multiuser workgroups. Administrators can set the system to output jobs with mandatory identification information that includes User ID, data, time, IP address, and printer serial number. This function creates a paper trail audit to improve accountability. Optimize efficiency. Lower energy consumption. Minimize your impact. These MFPs utilize smarter technologies that deliver greener operations and help your organization lower energy expenditures, provide a lower TCO, and accomplish a full range of document-related tasks without compromising the environment or your bottom line. And with features such as scheduled and remote system shutdowns, you can ultimately achieve lower Typical Electricity Consumption (TEC) values. To ensure that your print operations are on par with your eco-friendly goals, the MP 6503/MP 7503/MP 9003 displays eco-stats directly from the smart operation panel. The easy to access eco-friendly widget encourages reduced paper consumption and responsible usage. And with customized messages displayed on-screen, companies can further enforce their printing policies. Simple yet intelligent features support your efforts to reduce paper usage. Locked Print, Hold Print, and Store & Hold Print so documents are only printed when necessary. Scan-To options for electronic distribution and Preview Before Print functionality. Blank Page Printing Elimination to reduce unnecessary printing of blank pages. Preview before print, combine copy features, and advanced printing modes including automatic duplexing help to further reduce paper consumption. Enable your organization with professional end-to-end document production to streamline workflow, improve productivity, and control quality. Designed specifically for today’s businesses. Create paginated, duplexed, saddle-stitched booklets with the professional look of a flat-fold finish. With the ability to staple up to 20 sheets at a time, easily produce booklets of up to 80 pages. 65-sheet multi-position stapling capacity is included, and 2- or 3-hole punching capabilities are optional. Three destinations for output and a 2,000-sheet Shift Tray allow larger runs to output unattended, reducing the need for frequent operator intervention. For offices that routinely produce larger jobs requiring stapling and hole punching, the SR4120 offers 65-sheet multi-position stapling and optional 2- or 3-hole punching capabilities. For offices that routinely produce larger jobs requiring stapling and hole punching, the SR4080 offers 100-sheet multi-position stapling and optional 2- or 3-hole punching capabilities. The single-source Cover Interposer allows pre-printed covers and inserts to be easily fed into the finishing workflow at the touch of a button. This option eliminates the need for time-consuming off-line manual insertion and reduces wear and tear on originals. The CI4030 Cover Interposer can be installed with the SR4080 3000-Sheet Finisher. Note: The CI4030 Cover Interposers are not supported with the Mailbox CS4010. The single-source Cover Interposer allows pre-printed covers and inserts to be easily fed into the finishing workflow at the touch of a button. This option eliminates the need for time-consuming off-line manual insertion and reduces wear and tear on originals. The CI4040 Cover Interposer is compatible with the SR4120 3000-Sheet Finisher and SR4130 2000-Sheet Saddle-Stitch Finisher. Note: The CI4040 Cover Interposers are not supported with the Mailbox CS4010. To accommodate virtually any folding need completely in-line, the versatile FD4000 Multi-Folding Unit can be configured with the system to handle the production of folded newsletters, brochures, sales and marketing materials, menus, and more. Folding patterns include Half-Fold, Letter Fold-In (Tri-Fold), Letter Fold-Out (Tri-Fold), Gate-Fold, Double Parallel Fold (Four Fold), and Z-Fold. The 9-Bin Mailbox offers a variety of options to keep documents organized by designating specific pick-up points based on user, department, or output type. Separate incoming faxes from prints or copies. Assign bins for specific users or departments to ensure that output is always properly sorted and ready when it’s needed. Note: The Mailbox CS4010 is not supported with the CI4030 & CI4040 Cover Interposers. For businesses that routinely produce long runs of letter-sized output, the optional Large Capacity Tray provides an additional 4,000-sheet capacity of 8.5″ × 11″ paper, raising the system’s total paper capacity to a maximum 8,300 sheets. In environments where long runs of legal-sized output are the norm, the optional Large Capacity Tray can be configured with the 8.5″ × 14″ Paper Tray, which provides the system with an additional capacity for 2,500 sheets of 8.5″ × 14″, raising the system’s total paper capacity to 6,800 sheets.